This article originally appeared in SLAM 196. The 2015-2016 PBA Philippine Cup Finals rematch between the San Miguel Beermen and the Alaska Aces was not just a repeat of past showdowns. What we learned through seven games: it turned out to be a brand new experience on quite historic levels. “No man ever steps in the same river twice, for it’s not the same river and he’s not the same man,” is perhaps the most quoted passage of the Greek philosopher Heraclitus, and for good reason—there is poetry in things that, on the surface appear the same, but in reality are subtly or vastly different. The sentiment applies to snowflakes, fingerprints, the cells making up an organism between points in time and of course, PBA Finals rematches. The Alaska Aces have come a long way since their run in last season’s Philippine Cup. In that series, they were strictly a defensive team that fell to the San Miguel Beermen in seven games. This conference, the Aces owned a leopard’s bite of an offense (aside: the force of a leopard bite is 1,350 psi, which is elite in kingdom Animalia) to go with their crippling defense. San Miguel, meanwhile, is always great whenever it avoids hitting the snooze button. With such a talented roster that boasts of a 6’11’’ reigning BPC in June Mar Fajardo, a versatile stretch four in Arwind Santos and deadeye shooters in Marcio Lassiter and Alex Cabagnot—not to mention a deep bench—dismantling opponents had been somewhat routine. They finished the elimination round with a top ranking 8.1-point differential, per HumbleBola stats. Both teams entered the playoffs with a league best 9-2 record. The basketball gods must have raised their eyebrows before signing off on the second meeting, but not without adding a wrinkle to the rerun; in Game Six of the semifinals between San Miguel and Rain or Shine, Elastopainter Jireh Ibañes collided with Fajardo as the former boxed out the latter on a rebound play, causing June Mar to fall and clutch his left knee while on the floor. Although season-ending damage in his cruciate ligaments were ruled out, Fajardo would not make a finals appearance until Game 5. 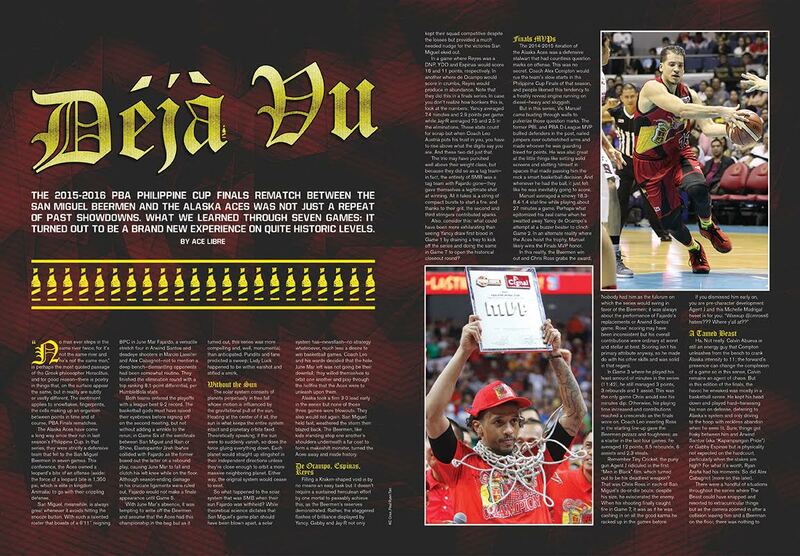 With June Mar’s absence, it was tempting to write off the Beermen and assume that the Aces had this championship in the bag but as it turned out, this series was more compelling and, well, monumental, than anticipated. Pundits and fans predicted a sweep; Lady Luck happened to be within earshot and stifled a smirk. The solar system consists of planets perpetually in free fall whose motion is influenced by the gravitational pull of the sun. Floating at the center of it all, the sun is what keeps the entire system intact and planetary orbits fixed. Theoretically speaking, if the sun were to suddenly vanish, so does the force gluing everything down. Each planet would straight up slingshot in their independent directions unless they’re close enough to orbit a more massive neighboring planet. Either way, the original system would cease to exist. So what happened to the solar system that was SMB when their sun Fajardo was withheld? While theoretical science dictates that San Miguel’s game plan should have been blown apart, a solar system has—newsflash—no strategy whatsoever, much less a desire to win basketball games. Coach Leo and his wards decided that the hole June Mar left was not going be their downfall; they willed themselves to orbit one another and play through the hellfire that the Aces were to unleash upon them. Alaska took a firm 3-0 lead early in the series but none of those three games were blowouts. They also would not again. San Miguel held fast, weathered the storm then blazed back. The Beermen, like kids standing atop one another’s shoulders underneath a fur coat to form a makeshift monster, turned the Aces away and made history. Filling a Kraken-shaped void is by no means an easy task but it doesn’t require a sustained herculean effort by one mortal to passably achieve this, as the Beermen’s reserves demonstrated. Rather, the staggered flashes of brilliance displayed by Yancy, Gabby and Jay-R not only kept their squad competitive despite the losses but provided a much needed nudge for the victories San Miguel eked out. In a game where Reyes was a DNP, YDO and Espinas would score 18 and 11 points, respectively. In another where de Ocampo would score in crumbs, Reyes would produce in abundance. Note that they did this in a finals series. In case you don’t realize how bonkers this is, look at the numbers: Yancy averaged 7.4 minutes and 2.9 points per game while Jay-R averaged 7.5 and 2.5 in the eliminations. These stats count for scrap but when Coach Leo Austria puts his trust in you, you have to rise above what the digits say you are. And these two did just that. The trio may have punched well above their weight class, but because they did so as a tag team—in fact, the entirety of SMB was a tag team with Fajardo gone—they gave themselves a legitimate shot at winning. All it takes is a string of compact bursts to start a fire, and thanks to their grit, the second and third stringers contributed sparks. Also, consider this: what could have been more exhilarating than seeing Yancy draw first blood in Game 1 by draining a trey to kick off the series and doing the same in Game 7 to open the historical closeout round? The 2014-2015 iteration of the Alaska Aces was a defensive stalwart that had countless question marks on offense. This was no secret. Coach Alex Compton would rue the team’s slow starts in the Philippine Cup Finals of that season, and people likened this tendency to a freshly revved engine running on diesel—heavy and sluggish. But in this series, Vic Manuel came busting through walls to pulverize those question marks. The former PBL and PBA D-League MVP bullied defenders in the post, nailed jumpers over outstretched arms and made whoever he was guarding bleed for points. He was also great at the little things like setting solid screens and slotting himself in spaces that made passing him the rock a smart basketball decision. And whenever he had the ball, it just felt like he was inevitably going to score. Manuel averaged a sinewy 18.3-8.4-1.4 stat-line while playing about 27 minutes a game. Perhaps what epitomized his zeal came when he swatted away Yancy de Ocampo’s attempt at a buzzer beater to clinch Game 2. In an alternate reality where the Aces hoist the trophy, Manuel likely wins the Finals MVP honor. In this reality, the Beermen win out and Chris Ross grabs the award. Nobody had him as the fulcrum on which the series would swing in favor of the Beermen; it was always about the performance of Fajardo’s replacements or Arwind Santos’ game. Ross’ scoring may have been inconsistent but his overall contributions were ordinary at worst and stellar at best. Scoring isn’t his primary attribute anyway, so he made do with his other skills and was solid in that regard. In Game 3 where he played his least amount of minutes in the series (11:42), he still managed 3 points, 3 rebounds and 1 assist. This was the only game Chris would see his minutes dip. Otherwise, his playing time increased and contributions reached a crescendo as the finals wore on. Coach Leo inserting Ross in the starting line-up gave the Beermen pizzazz and toughness; as a starter in the last four games, he averaged 12 points, 6.5 rebounds, 6 assists and 2.3 steals. Remember Tiny Cricket, the puny gun Agent J ridiculed in the first “Men in Black” film, which turned out to be his deadliest weapon? That was Chris Ross in each of San Miguel’s do-or-die bouts; despite his size, he eviscerated the enemy. When his shooting finally caught fire in Game 7, it was as if he was cashing in on all the good karma he racked up in the games before. Ha. Not really. Calvin Abueva is still an energy guy that Compton unleashes from the bench to crank Alaska intensity to 11; the forward’s presence can change the complexion of a game so in this sense, Calvin remains an agent of chaos. But in this edition of the finals, the havoc he wreaked was mostly in a basketball sense. He kept his head down and played hard—harassing his man on defense, deferring to Alaska’s system and only driving to the hoop with reckless abandon when he sees fit. Sure, things got frisky between him and Arwind Santos (aka “Kapampangan Pride”) or Gabby Espinas but is physicality not expected on the hardcourt, particularly when the stakes are high? For what it’s worth, Ryan Araña had his moments. So did Alex Cabagnot (more on this later). There were a handful of situations throughout the series where The Beast could have snapped and resorted to extracurricular things but as the camera zoomed in after a collision leaving him and a Beerman on the floor, there was nothing to witness besides Abueva rising to his feet and walking away with a blank expression. Seeing Calvin get over himself by keeping his composure is admirable because it means he’s prioritizing being useful to his team over the short-term pleasure of giving in to his emotions—a sign of his growth not just as a player but a human being. Boy, was this a big deal. A (literally) huge factor behind Arwind’s Finals MVP in the previous Philippine Cup was June Mar Fajardo. The center’s gravity pulls in the defense, which frees up space for San Miguel’s outside shooters, and this gives the Beermen an edge over opponents. Blah, blah, blah. This should be common knowledge but Santos’ hasty critics couldn’t seem to put two and two together. Without Fajardo, SMB’s spacing drastically changed—and spacing was just the tip of the iceberg. YDO and Espinas were not as big a threat on the inside. This meant help defense wasn’t as likely to come unless absolutely necessary. In turn, this meant that Santos and the rest of the squad would be much better defended—and we’re talking about an unshakable Alaska defense here. This, combined with plain old crappy luck, contributed to Spiderman’s lowly 18.2% field goal shooting in Game 1 and 17.6% in Game 3. The danger in equating points and field goal percentages to overall performance quality is that it overlooks the other important facets of a player’s game. Those calling for Arwind’s benching or trade were probably blind to his 5 rebounds, 2 assists, 2 steals, and block in Game 1 and his 81.3 defensive rating in Game 3. Scoring isn’t everything. It took two overtime games for the Beermen to make it a series and another win to force a rubber match. Who saw that coming? With the 3-0 lead, Alaska was perfectly set up to exact their revenge. Perhaps the losses forced Austria’s squad to take a good hard look at themselves to pick out the things they were doing wrong and straighten them out as each game came and went. Perhaps it was Leo Austria’s way of decoding the Xs and Os that Compton would employ and come up with chess moves of his own. 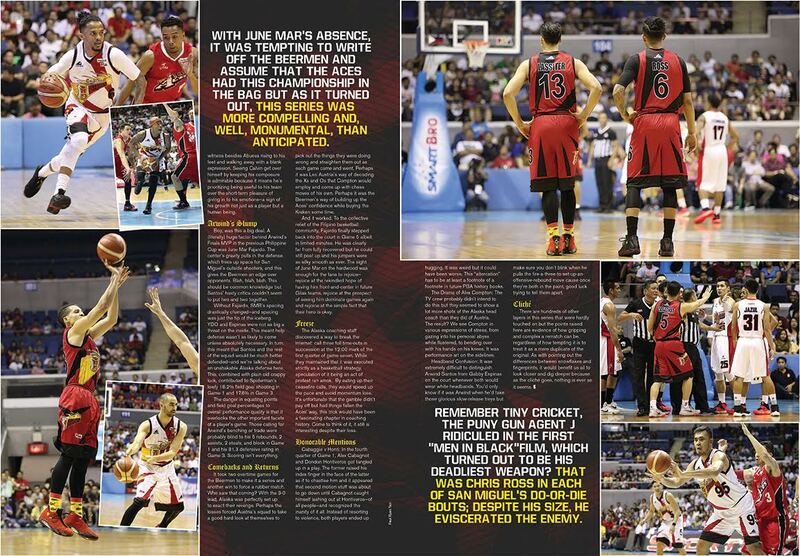 Perhaps it was the Beermen’s way of building up the Aces’ confidence while buying the Kraken some time. And it worked. To the collective relief of the Filipino basketball community, Fajardo finally stepped back into the court in Game 5 albeit in limited minutes. He was clearly far from fully recovered but he could still post up and his jumpers were as silky smooth as ever. The sight of June Mar on the hardwood was enough for the fans to rejoice—rejoice at the rekindled hope of having him front-and-center in future Gilas teams, rejoice at the prospect of seeing him dominate games again and rejoice at the simple fact that their hero is okay. The Alaska coaching staff discovered a way to break the Internet: call three full time-outs in succession at the 12:00 mark of the first quarter of game seven. While they maintained that it was executed strictly as a basketball strategy, speculation of it being an act of protest ran amok. By eating up their ceasefire calls, they would speed up the pace and avoid momentum loss. It’s unfortunate that the gamble didn’t pay off but had things fallen the Aces’ way, this trick would have been a fascinating chapter in coaching history. Come to think of it, it still is interesting despite their loss. Cabaggie v Honti: In the fourth quarter of Game 1, Alex Cabagnot and Dondon Hontiveros got tangled up in a play. The former raised his index finger in the face of the latter as if to chastise him and it appeared that second motion stuff was about to go down until Cabagnot caught himself lashing out at Hontiveros—of all people—and recognized the inanity of it all. Instead of resorting to violence, both players ended up hugging. It was weird but it could have been worse. This “altercation” has to be at least a footnote of a footnote in future PBA history books. The Drama of Alex Compton: The TV crew probably didn’t intend to do this but they seemed to show a lot more shots of the Alaska head coach than they did of Austria. The result? We see Compton in various expressions of stress, from gazing into his personal abyss while flustered, to bending over with his hands on his knees. It was performance art on the sidelines. Headband Confusion: It was extremely difficult to distinguish Arwind Santos from Gabby Espinas on the court whenever both would wear white headbands. You’d only know if it was Arwind when he’d take those glorious slow-release treys but make sure you don’t blink when he pulls the fire-a-three-to-set-up-an-offensive-rebound move cause once they’re both in the paint, good luck trying to tell them apart.